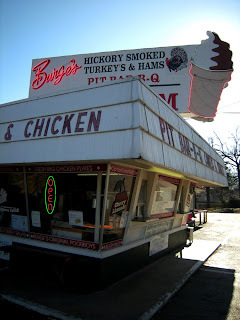 Burge's, Smoked Turkey That Took Over The World. Most restaurants begin with a concept or a family dream. Burge's began with a backyard smoker -- and a whole lot of friends who loved what came out of it. 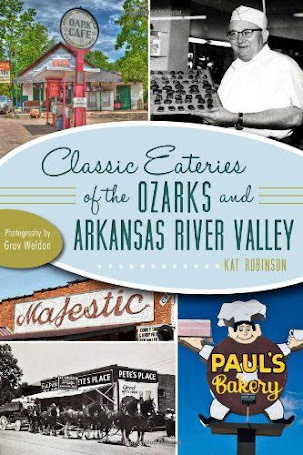 It took nearly 10 years to get to a restaurant, but what was created there has endured generations. Back in 1953, Alden Burge moved from Shreveport to a little town south of Hope, called Lewisville. Burge was a hand in the oil fields, but he also liked to dabble in meat smoking, so he built a smokehouse in his backyard. It didn't take long for that smoke to travel, and eventually Burge started sharing the benefits of the little smokehouse, bringing smoked chickens to Friday night ballgames along with baked beans and coleslaw. Burge's Dairyette in Lewisville, circa 1960s. Some nine years later, Burge was offered the chance to run a little dairyette at the intersection of Highway 82 and Highway 29. It seemed a prime opportunity for his family -- so he and his wife and their three kids jumped in to create this family-run barbecue joint. It caught on quickly -- fueled by the great wonders of smoking Burge had refined and paired with a magnificent round of burgers, ice cream desserts and family traditions. 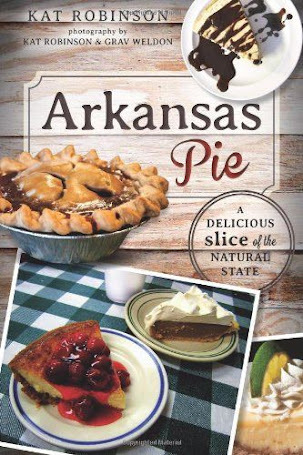 The place became well known for its smoked hams and turkeys -- which some folks passing through would take with them -- and for smoking goat and serving peppermint ice cream on Independence Day (smoked goat seems to be a theme with Arkansas family-run barbecue joints). 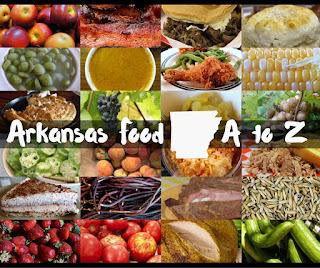 Now, Lewisville is about 130 miles or so from Little Rock... but it lays along a road (Arkansas Highway 29, which becomes Louisiana Highway 3 on the other side of the border) that connects Arkansas's capital with Shreveport. 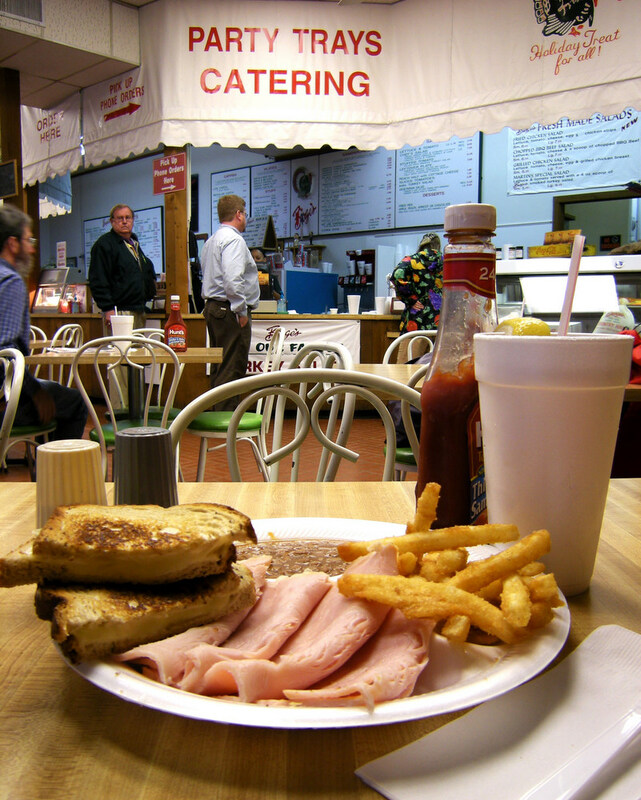 It became the best place to stop and refresh along the route, and many a weekend traveler would end up back in River City with a smoked turkey or some of that ham or even some smoked cheese. 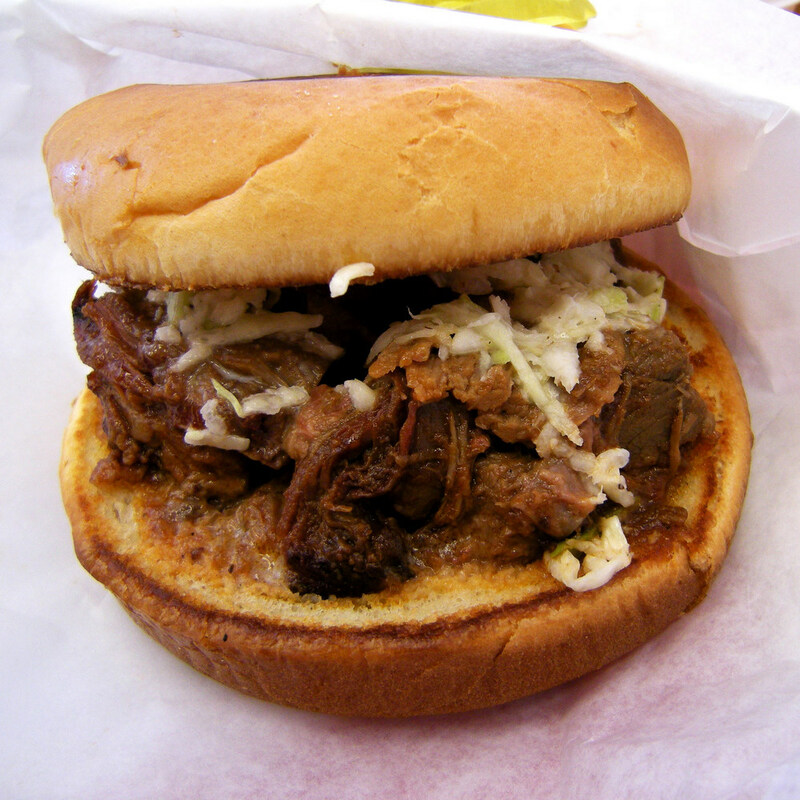 There was definitely a need for good smoked meat in Little Rock, right? 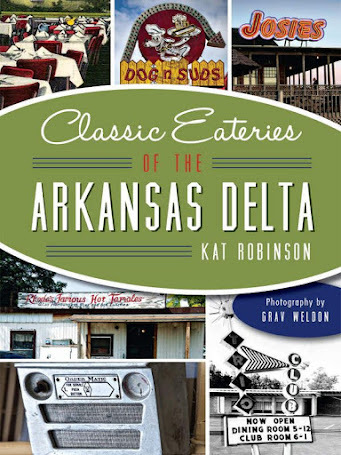 And in 1977 Alden Burge opened the second location on R Street in Little Rock's Heights district. two sides and a grilled cheese sandwich. Now, if you're not an Arkansawyer, none of this might tick a memory box. 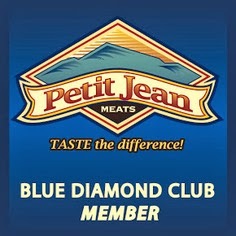 But you might be familiar with the products offered at both restaurants, anyway. See, that smoked turkey is something that cannot be compared. The brine, the smoke, everything about the preparation of a Burge's smoked turkey is meticulous -- and the meat comes out so flavorful, it bears a resemblance to ham. Indeed, many people I know -- and I am one of them, imagine that -- take their post-Thanksgiving or post-Christmas turkey carcass and utilize it for the seasoning in New Year's Day peas. Salty, sweet, it's addictive. As is the understated dish you'll find in the cooler at the restaurant. It's the turkey salad. It doesn't look like much -- chopped turkey and mayo and not much more. But trust me. It's more addictive than crack. Thing is, turkey may be the overwhelming product Burge's has given us (the website is actually smokedturkeys.com, after all!) but there's so much more on the menu. 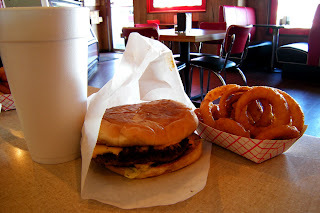 I think the Lewisville location does the better burger, but that comes more from its dairyette roots. Likewise, I think the better ice cream is served in Lewisville. 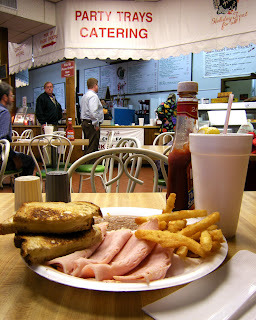 But the Little Rock location does pimento cheese in its cooler, and almost always has fried pies in the heated case. And the Little Rock location always has whatever I am looking for to add to my immediate larder -- smoked meats, smoked cheeses, tubs of the pimento cheese and the turkey salad and even Mexican Coke for me to enjoy while I'm gnawing on a smoked beef brisket sandwich (enormously underrated, in my honest opinion). Plus, it is far closer. However you slice it, two locations of Burge's are just close to being enough to make any Arkansawyer happy. Fifty years of restaurant success sure confirm that. Russellville: Taco Villa is Consistanty There. A Somewhat Short Guide to Attending Wakarusa. 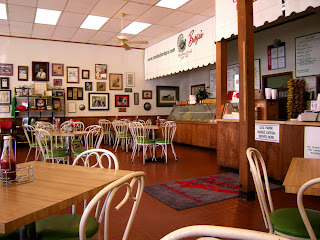 The Scent of Memory: Klappenbach Bakery.